EtsyMarketingTool is an easy-to-use web-based tool - No download is required. This online tool is very flexible and allows you to automate your renewals according to the time and frequency of your choice. Sign up for a free trial now. Choose 'Oldest Item' to let our tool pick the oldest item to renew. This will allow you to cycle through all the shop items. 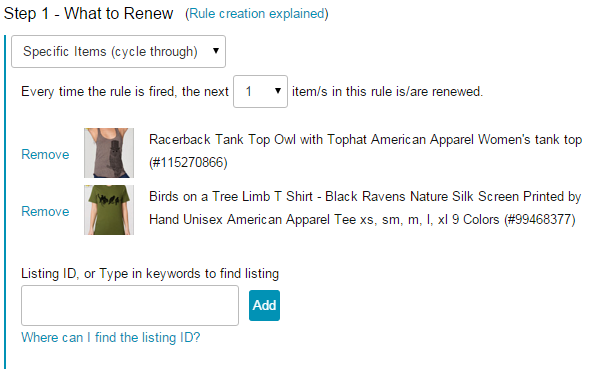 Or, choose 'Random Items' to let our tool randomly choose the item(s) to renew. Or, choose 'Expired Items' to renew the most recently expired item. Or, choose 'Random Items (by keywords)' to narrow down the choosen item(s) to only those that have any of these keywords in their title. 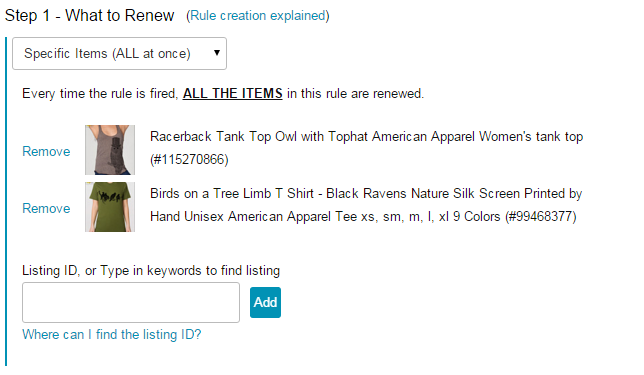 Or, choose 'Specific Items' to achieve higher exposure to only specific items. Or, choose 'Specific Items (cycle through)' to cycle through specific items.